1. 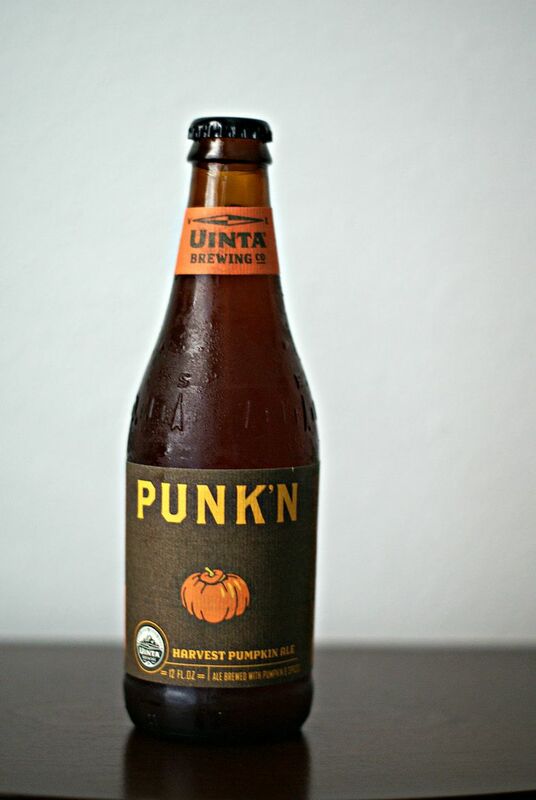 Uinta Punk'N: With 4% ABV this was one of the lower alcohol percentages of the pumpkin beers I tried. It had a definite pumpkin smell but was spicier than some of the other pumpkin beers I tried, this one had a true light pumpkin, earthy flavor with a slight hoppy finish. 2. 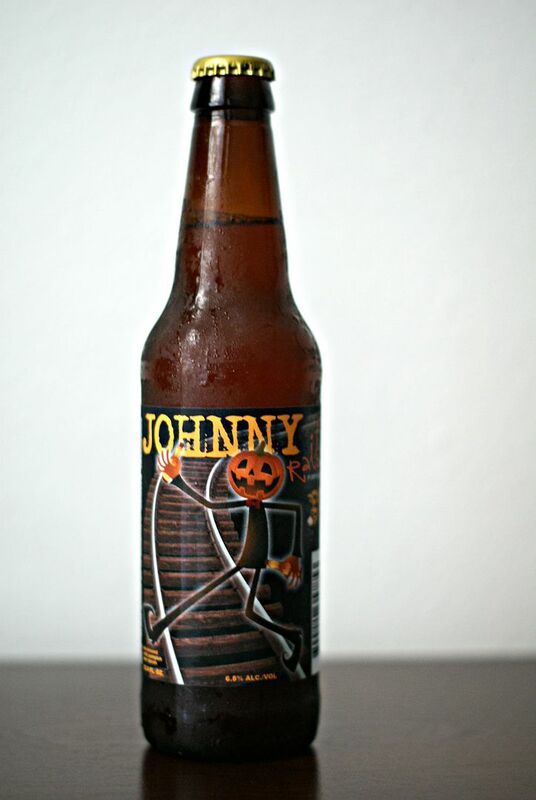 Johnny Rails Pumpkin Ale: This one came in at a 6.5% ABV and is a blonde based ale so it was lighter than some of the others and a typical pumpkin ale. It had a slight hint of pumpkin on the nose and had a strong dry pumpkin flavor that was slightly spicy. 3. Traveler Jack-O Shandy: This was one of the beers I was most intrigued by. When you think of shandy's you think of summer, so I was definitely curious about how this was going to taste. At 4.4% ABV it was on the lower alcohol level but one of the sweetest as well. You could immediately tell this was a shandy and not your typical ale. It starts sweet but you can taste the pumpkin and spices with a little hint of lemon. This almost reminded me more of a pumpkin pie than anything. 4. 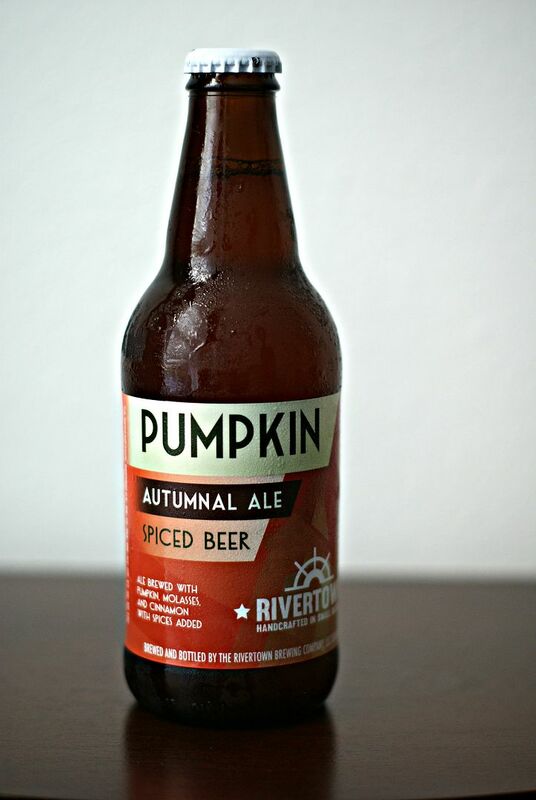 Rivertown Brewing Pumpkin Autumn Ale Spiced Beer: This beer has a 5.2% ABV so it's about the same as an average beer. At first I thought it tasted like a lighter Oktoberfest beer but after a few sips it started tasting more like a lightly spiced water than anything. The pumpkin flavor was very light and even the spices were hard to distinguish. Definitely the lightest of the beers I tried, it was very easy to drink but didn't have a lot to remember it by. 5. 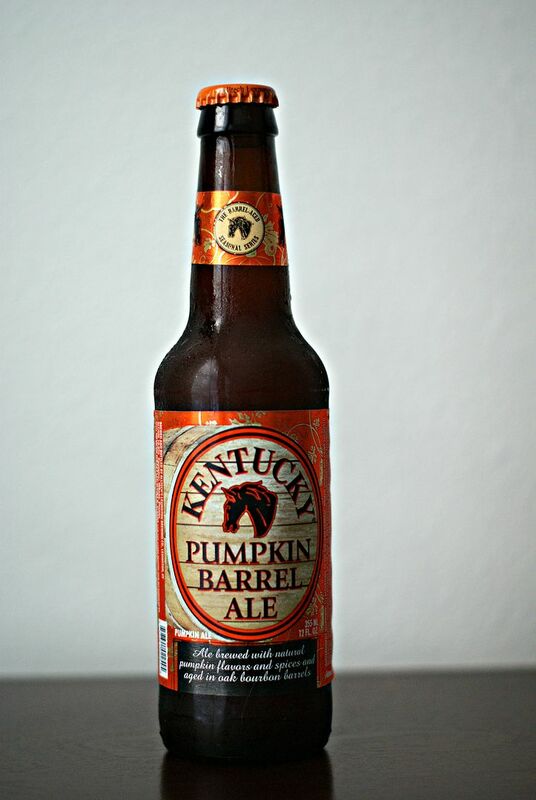 Kentucky Pumpkin Barrel Ale: This was the one I was the most excited about trying strictly for the bourbon barrel aspect of it, I was curious as to how the bourbon would mix with the pumpkin and spices. At 10% ABV this was by far the highest of the beers I tried and you could immediately taste it on the first sip.It's definitely a low pumpkin, low spice flavor but you do get the spicy, pumpkin aroma with hints of oak. The bourbon taste was present with a drier finish but not overwhelming although I will say the warmer it got the more pronounced the bourbon taste got. 6. 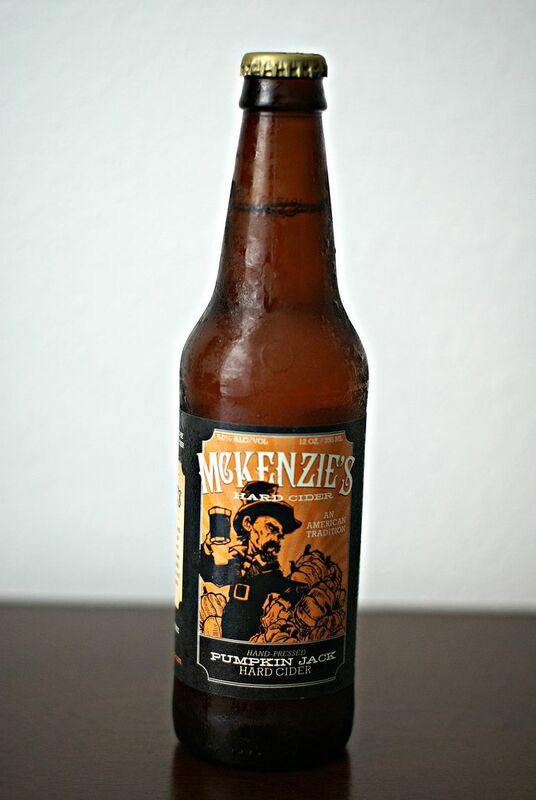 McKenzie's Hard Cider Pumpkin Jack: This is completely different from the other pumpkin beers I tried since it's actually a cider. I'm a huge fan of all the other flavors of McKenzie's Hard Ciders so I was definitely interested by the thought of a pumpkin cider. At 5% ABV it's pretty average for a cider and it definitely had the cider appearance. The cider definitely has the pumpkin pie flavor instead of the straight pumpkin or spices you got with most of the other beers.It had a smooth, mild finish. The closest thing you can get to drinking your dessert! I don't drink beer, but the cider sounds intriguing. And the both labels, way too cute! I have tried a few pumpkin beers, but wasn't a fan. They had way to much spice in them. I haven't tried any of these, so this is awesome! Thanks for sharing! I'm not a big ale drinker, but I will always try new beer! I love the names and labels of them all too. I love the Travelers shandys and any cider, so I wish I could try those out! Pumpkin is not my favorite flavor but I always try things thinking one day I'll like it maybe :) Hope you had fun trying all these out! I love this post!! I’ve been wanting to pick up some pumpkin beer this year but overwhelmed at the options and didn’t want to get a 6 pack of beers that I end up hating. Going to check and see if any of these are sold by me! Love this! The only one I have tried out of the bunch is the Jack-O Traveler and it wasn't my favorite! Way too sweet! I really like the Pumpking pumpkin beer even though its like almost 9% haha! I don't really drink beer but I do get excited for seasonal ones like this! I'll have to share this post with my fiance...he doesn't like to admit it but he is totally down with the pumpkin trend! I'm not a huge beer drinker but I do like trying some season ones! Pumpkin is always a fun flavor to try! We love pumpkin beer! Especially win the rim has brown sugar and cinnamon, have you tried Cottonwood, it is equally as good. I've never been on the pumpkin train... but something tells me I can get on board with it in beer form. Unita is one of my favorites for Pumpkin beer:)! If you haven't tried Pumking by Southern Tier, I highly recommend it! It's a got a strong spiced flavor and is richer in pumpkin than most of the others, but it tops the charts for me! These all sound so good! I definitely have to try a few of these. I'm not a huge fan of beer, but my husband LOVES pumpkin beer! I would definitely give the cider a try and I will share these with my husband...he will be so excited! Can't tell you how much I love this post! I'm intrigued by the idea of a pumpkin shandy. I think I'm going to have to try one now, for science. And you can sign me right up for the bourbon barrel ale. Aww!! I love this haha. I love pumpkin beers but sometimes they can seem a bit heavy. I like that you listed all of the details to help me better pick!! I'm not a big beer drinker, but I was just thinking it be fun to get some to drink on Halloween. I need to try one of these out! I love this idea! I really like pumpkin beers that aren't too sweet. I had some last week, a Blue Point brew that was really good! 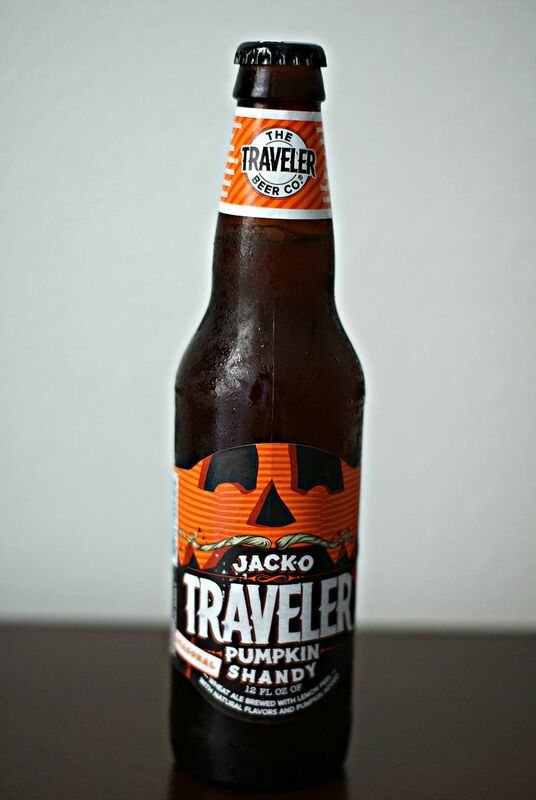 I love the taste of Traveler Jack-O Shandy and surprisingly I haven't tried or seen any of the others! Yumm will look for them next time I'm at the liquor store. You know I love this post! I'm glad you found the pumpkin barrel! It does get overwhelming if it gets warm! I always have to drink them super cold! I've been trying allll of the pumpkin beers I can find this year! I'm so intrigued by the pumpkin hard cider - that one sounds delicious! I love, love, love pumpkin beers! I also love finding these posts so I can know which ones to try. We had a pumpkin porter this year at a local brewery and it was so good. I agree that it's awesome that there are now a lot of varieties of pumpkin beers other than just ales. I also like the stereotypical leinekugals pumpkin shandy. It's very pumpkin-pie ish! I got that hard pumpkin cider and it was so sweet! I was bummed because the guy at Total Wine really talked it up! My favorite pumpkin beer is by Terrapin. It is not too sweet but just has enough pumpkin flavor! Oh and Ballast Point makes a really good one too! I do not know the last time I had a pumpkin beer but now I am CRAVING it!! You should add Pumpkick by New Belgium to your list. It's a pumpkin-clove-cranberry mix, delish! what a fun post! i kind of want to try the punk'n one just for the name. i'm not a huge fan of pumpkin and the way americans spice them (i really don't mean that in a bad way lol just in a i like my pumpkin plain way) but the shandy intrigues me! Such a fun post! I don't drink beer, but I am sending a link to this to my husband because I know he will want to try the cider! I used to love pumpkin beer more than anything but haven't been able to drink beer anymore, I've been sticking to the ciders so I HAVE to try that pumpkin cider! Jack O Traveler is one of my favorites out of this bunch. I haven't tried McKenzie's Hard Ciders and I didn't realize the Kentucky Bourbon had a pumpkin option! My husband would love that. My favorite pumpkin beer is Funky Pumpkin from Boulevard. It is truly amazing! I was almost going to try the Jack-O Shandy at Yard House last weekend and regret not trying it now. I don't really like beer, but the sweeter, lighter ones are my fave! I don't know if I've ever had a pumpkin beer - I need to try even though I'm not a huge pumpkin flavoring person! Definitely sharing this with my husband though! I love a PSL latte from Starbucks, but I don't think that I've ever tried pumpkin beer. I've plenty of Oktoberfests, so maybe I need to pick up a few to try. I think that the first or second one might be right up my alley! I'm not a beer person or a pumpkin flavor person... but the last one, the cider, definitely intrigues me!!!! I need to try that cider! 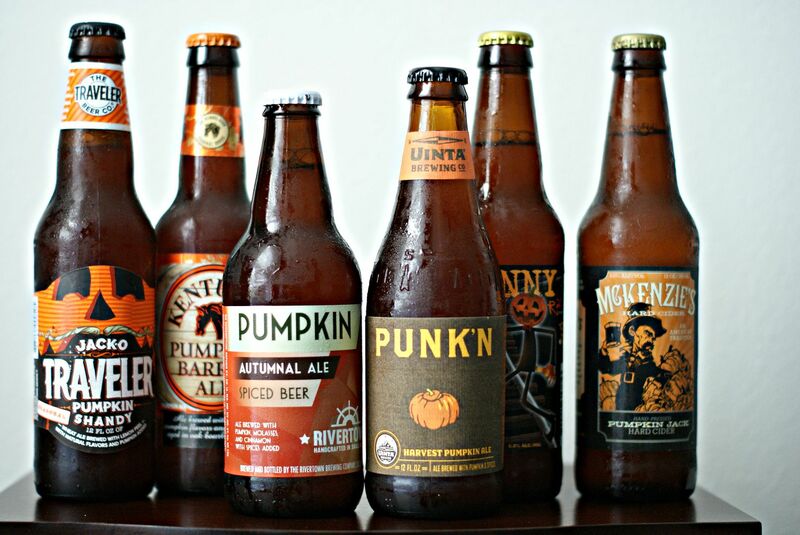 I love pumpkin beers and I don't believe I have ever had any of these. Maybe they don's sell them in the north. But that cider sounds amazing!